This week, market participants will be looking for signals and price moves should the US decide to impose tariffs on about $34 billion worth of Chinese imports. Markets will also be looking out for any potential retaliatory move from China. In oil, US President Donald Trump says Saudi Arabia has agreed to increase oil production by up to 2 million b/d to moderate high prices. Meanwhile, Middle East crude producers could raise Official Selling Prices for heavier grades in the coming days, as fuel oil cracks have been strong. This episode also includes updates on the ongoing biodiesel shipments from Indonesia to China, the absence of a reference price for term contracts for Japanese thermal coal customers, and the rising primary premiums for aluminim delivered to Japan. This week: the US said Saudi Arabia has agreed to hike oil output, thermal coal market seeks price direction, and aluminum contract premiums rise. But first -- commodity markets will be on tenterhooks as July 6 approaches – when the US is expected to impose tariffs on about 34 billion dollars worth of Chinese goods. Market participants will be looking for signals and price moves after the first round of implementation. 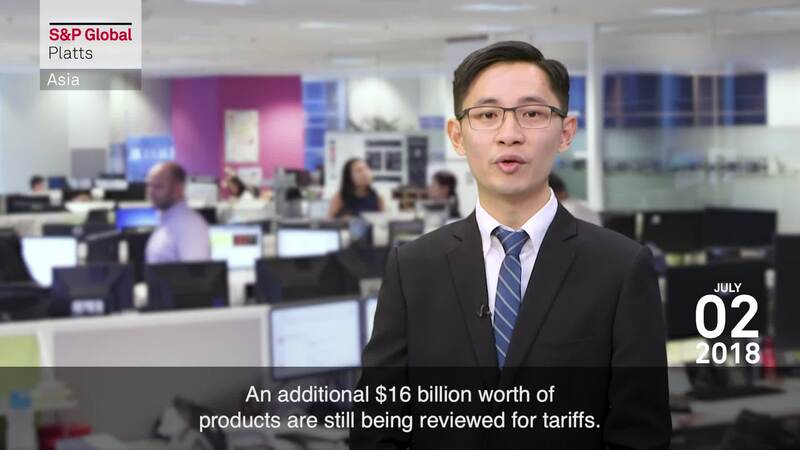 An additional 16 billion dollars worth of products are still being reviewed for tariffs. And of course, markets will also be looking out for any potential retaliatory move from China. Do you expect both sides to impose tariffs? Send us your thoughts on Twitter with hashtag PlattsMM. In oil, US President Donald Trump says Saudi Arabia has agreed to increase oil production by up to 2 million barrels per day to moderate high prices. In a tweet on Saturday, Trump said he had asked King Salman of Saudi Arabia to increase production because oil prices were too high, and the King had agreed. A Saudi-based analyst said such a sharp increase would have to come from Saudi stocks. Still in oil, Middle East crude producers could raise Official Selling Prices for heavier grades in the coming days, as fuel oil cracks have been strong. On the other hand, OSPs for lighter grade are expected to be flat to weaker as naphtha cracks have been relatively weak, while competition from light US arbitrage cargoes remains robust. In agriculture, biodiesel shipments to China from Indonesia are continuing, with the market expecting about 200,000 mt of PME to have been exported from Malaysia and Indonesia in June. As the arbitrage remains open due to low palm oil prices, sellers are wondering how long the Chinese will continue to buy PME from Southeast Asia, and whether this demand will provide a bullish push to palm oil prices. Moving to thermal coal, market sources are seeking clarity this week on pricing for term contracts for Japanese customers in the absence of any Japanese Financial Year reference price for the first time in several decades. Japanese buyer Tohoku Electric and Australian shipper Glencore are unable to agree a price for 2018-2019 contracts after talks between the two sides broke down last week. Finally, in metals, primary aluminum premiums delivered to Japan settled last Friday at $132/mt CIF basis for the third quarter. This was up 2.3% from Q2 contract premiums, and up 28% from Q1. Will the gap with spot premiums now widen going forward, as the summer season demand lull approaches? If you are in Tokyo, we'd love to see you at the S&P Global Platts Japan Commodity Market Insights forum on July 4th and 5th, where we'll be sharing insights on key topics affecting the energy and agricultural markets. Visit Platts.com for details.